On Sale Now! Save 4% on the Stan's NoTubes 32mm Schrader Valve Stem by Stan's NoTubes at Melon City Bike Club. MPN: NTVTS_Noir. Hurry! Limited time offer. Offer valid only while supplies last. 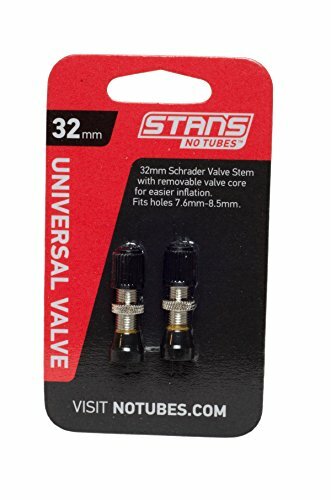 Stan's No Tubes 32mm Schrader Valve Stem w/10mm base. Compatible with straight valve hole Hugo 52 rims and designed to fit 7.5 - 8.5mm valve holes. Stan's No Tubes 32mm Schrader Valve Stem w/10mm base. Compatible with straight valve hole Hugo 52 rims and designed to fit 7.5 - 8.5mm valve holes. Sold as a pair. Note: For "Stepped" valve hole Hugo use part AS0105 (32mm Schrader Valve Stem w/14mm base). If you have any questions about this product by Stan's NoTubes, contact us by completing and submitting the form below. If you are looking for a specif part number, please include it with your message.